Faction Ranking missions are now available – are you up to the challenge? Once you’re Level 50, are finished with at least the entirely of the Tokyo storyline, and have an Item Power of at least 250, a new series of tasks become available, allowing you to increase your standing within your Faction! As they say, nothing of value comes for free: You have to show some backbone and commitment – you have to prove yourself! Into Darkness has you infiltrate a mysterious car park. Hope you’ve brought a change of pants! Venetian Missile Crisis tasks you with delving into a Phoenician compound. Go blow things up! Rogue Agent has you hot on the tail of…well, someone you need to chase. These missions provide extra challenge aimed at seasoned agents, and competing your ranking missions unlocks the remaining iterations of your faction uniform, an additional Agent Network mission slot, a brand-new Agent Dossier, and new faction-specific headgear! In addition to Faction Ranking missions, those agents infiltrating New Dawn in South Africa may access one new Sabotage mission titled “Public Enemy Number One”. Phanth has launched a competition today that will run through till the 15th August. Are you 9S tank enough? 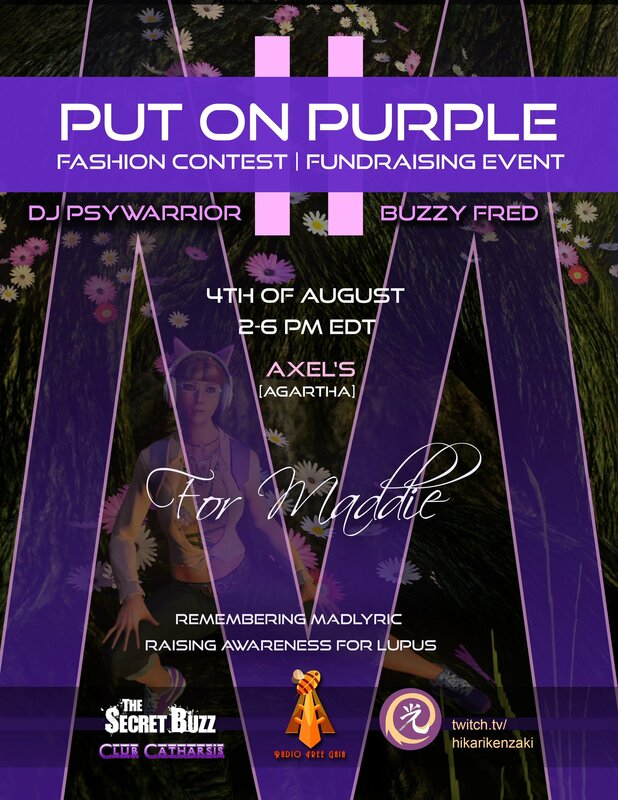 The event will include two fashion contests and fundraising for http://lupus.org in honor of MadLyric. Let's join with our community and go PurpleForMaddie and aim high! Rokynn joins the 9S Leadership team! Today we are very excited to announce that Rokynn has been promoted into our Nine Swords leadership team. We are very pleased that he has agreed to join our leadership team and that he will be side by side with Phanth, fighting over cookies and ensuring we have a strong PvE division to cater for all our monster bashing needs! Congratulations on your promotion, Rokynn!! Andy posted over in the official Secret World forums today to talk a little bit about upcoming missions, due in the coming weeks. One of these new missions will be a new action mission set in New Dawn that may help answer a loose thread encountered in South Africa. The other missions, are three Faction Ranking Missions, redesigned for Secret World Legends: Into Darkness, Venetian Missile Crisis, and Rogue Agent! You can also discuss this new news here in our internal forums, Swords!